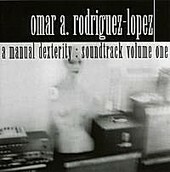 Omar A. Rodriguez Lopez sounds like a name of a Spanish explorer from the 1600's, but in fact he is the guitarist from The Mars Volta/ ex-At the Drive-In, who has recently released a solo album. This 10-track offering is quite possibly the most self-indulgent journey into free form musicianship you'll find, as Lopez and friends (including John Frusciante and TMV partner Cedric Bixler-Zavala) hit the studio like kids in an unsupervised candy store. The result yields an album containing tinges of Latin jazz meeting spaced-out salsa, psychedelic rock like Hendrix meets Zappa on Mars, and all the weird noises you could muster when locked in a studio for an inordinate amount of time. A Manual Dexterity may require a lot of attention span and some good intoxicants to truly enjoy, but it's a disc surely worth the trouble.